Fashion wedding fashion this season already passed,therefore we can say about the new developments and trends in this area. Each year, the bride would expect fresh ideas for their costumes, so the designers presented original versions lush skirts on wedding dresses, bridal accessories interesting and unusual hairstyles. New Fashion 2015 - it's all shades of blue, turquoise, mint and pink wedding. A most unexpected trend for brides - black wedding dress, accessories, shoes. Wedding fashion of the year devoted to romance andfemininity. The trend in the moving images clearly reflected in the collections of leading brands. Designers in dresses of the season in 2015 used a modest neckline and open bodices disguised openwork lace. In place of candid wedding dresses that were fashionable before, came elegant model with miniature cuffs, rounded line of the cut, fine fabrics and embroidery. Wedding dresses with long sleeves executedlace and sleeves are sewn in the form of air veil on his shoulders. This technique designers have taken from the still current retro style. As for texture, then still in vogue bridal dress, sewn from light fabrics such as silk, chiffon, lace, organza. Wedding models of this season, completely devoid of glamor glitter, which was in the trend of previous years. Furnish of shiny rhinestones or crystals bride 2015 will not see. While white is still relevant for the imagebride, women are increasingly choosing wedding dress of blue, violet and coral shades. 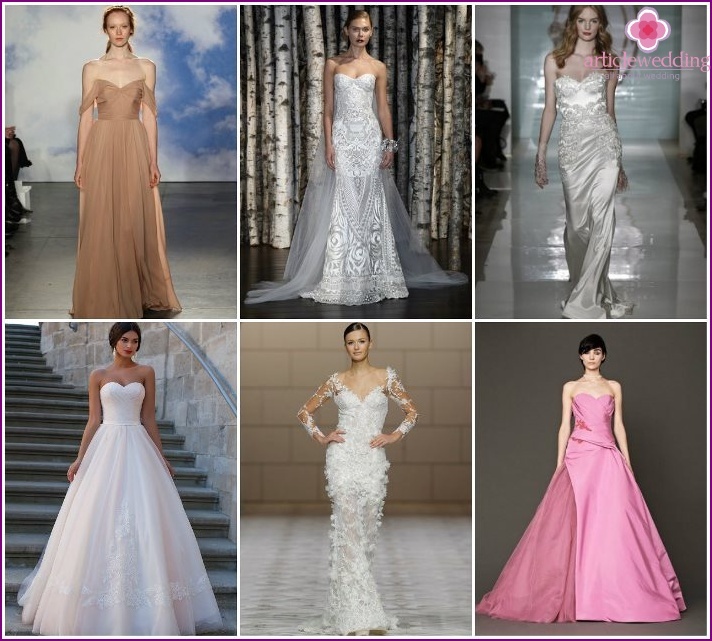 In the wedding season 2015 are relevant all shades of white: pearls, vanilla, creamy, ivory. In fashion, as always silhouettes "princess" and "mermaid", and long dress with a train. Practical brides choose detachable plume, which can be easily removed after the official part of the ceremony. 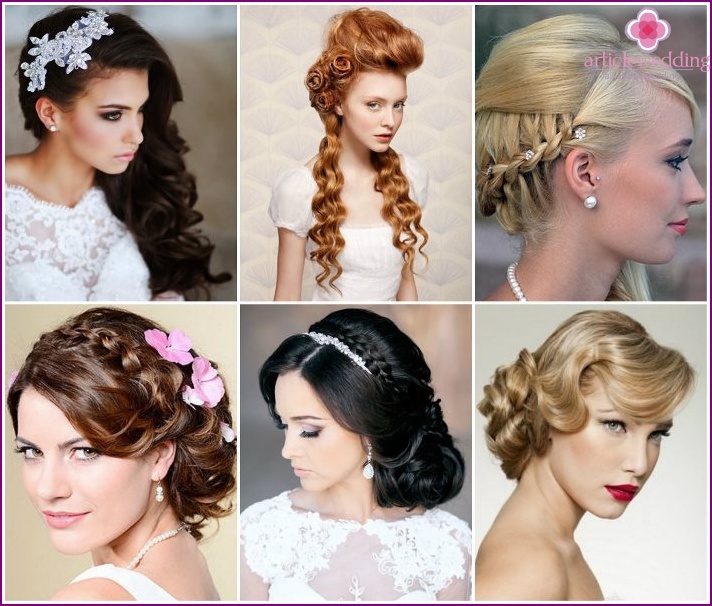 Popular hairstyles stacked side hair -they are ideally combined with feminine wedding dresses and look very gently. The traditional veil must be concise in this year, partially covering the face of the bride. Excellent would look if a veil decorate with flowers, feathers and other decorations, especially if the image created by the bride in retro style. But if the bride is not ready to abandon the classics, then it is allowed to decorate the hair style multi-tiered veil. If the bride's short hair, the stylistsare advised not to be limited to the wedding styling and beautifying the hair frivolous hat, luxurious tiara, satin ribbon or colorful feathers. These fashion accessories to make a girl irresistible. If you want outrageous, the haircut is even shorter: the unexpected combination of romantic dress and an incredibly short styling will not go unnoticed at the wedding. 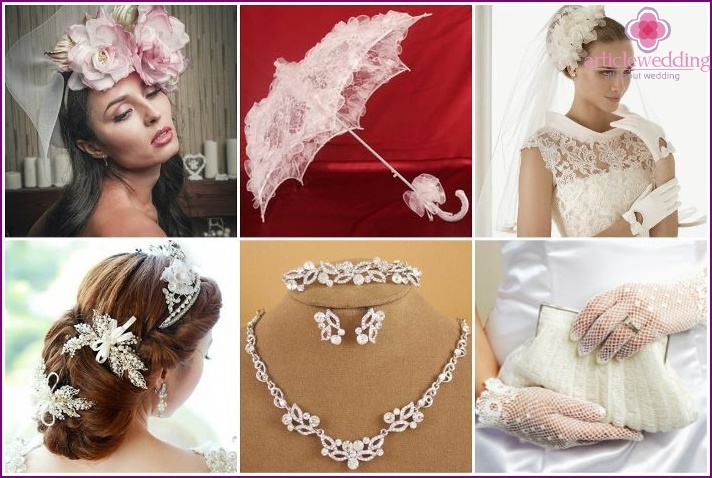 Amazing number of weddingaccessories 2015. Dresses decorated with lace bows, belts embroidered with pearls or colored lace. All kinds of draperies adorned with flowers or bulky applications, and the bride's hair weave diverse and unexpected decor. Fashion jewelry new wedding season joined the classics, advanced design and modern technology. Relevant non-standard jewelry with geometric patterns and different colors combinations. It has become fashionable to get married in a hat and have aa delicate white umbrella - a tribute to the retro style. Veil, too, will be able to fulfill the role of a veil, but the hair should be neat and well thought-out. If the wedding dress maxi selected, it is best to use a veil length flush with the dress: a multi-tiered, lush, with edging or decorated with flowers overhead. Fata is presented on the catwalks of the wedding in 2015 only a few models, as designers prefer to see brides this year with original hairstyles. Fashion classic white bride's shoes are notI passed, but in 2015 the trend shoes with high heels or wedges comfortable. If the choice fell on a magnificent bride short dress, the perfect shoes to her high heels with a rounded toe. For a wedding dress or mini midi better to choose open-toed sandals with perfectly accentuates the beauty of the bride's legs. 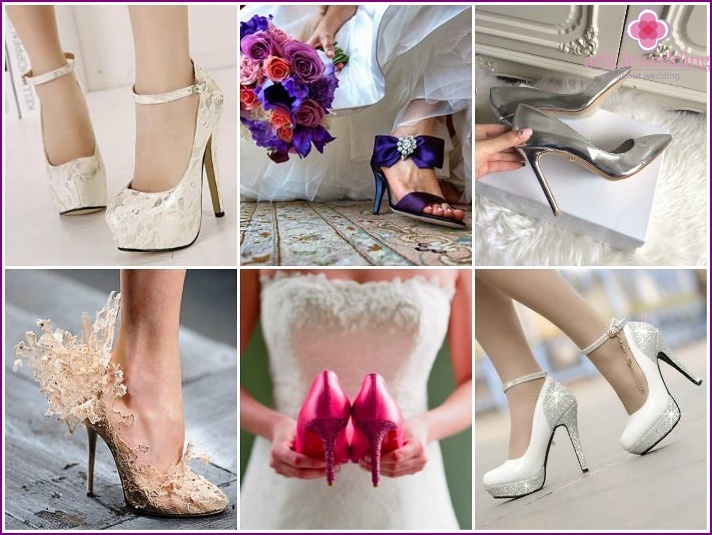 Very gently look lace shoes wedding- If they are designed for this solemn event. They are represented not only in the white version, but also in bright colors: purple, red, pink and even black. For wedding dresses in pastel colors are perfect physical, shades of beige shoes, and to make the image of the royal bride, you need to buy shoes with metallic luster of silver or gold. In the vogue bride's shoes, decorated with lace,beads or pearls, but the shiny rhinestones on the backburner. The most relevant is the embroidery on the back or front shoe. Look beautiful square or asymmetrical loops on the shoes of the bride, which is positioned on the outer side of the foot. The girls, who are planning their wedding on the beach, fashion designers offer to wear sandals without heels, decorated with different decor. Trends in wedding floristry develop,therefore year-on-year changes in the fashion combinations of colors, palette, decoration bouquets bride. In this season, wedding bouquets for florists is composed of different colors, different from each other in shape, form and shades. The main thing - do not depart from the similar and match colors to a wedding floral arrangement was harmonious. There was a fashion for small bunches thatbride corsage called. They are fixed on the left shoulder or waist wedding dress bride. The main advantage of the bodice - the size and weight, so the bride can easily wear it throughout the day. In a fashion natural floral compositions: wild flowers growing in the garden or woods. Interestingly looks chaotic bouquet of wildflowers - protruding slightly disheveled, as if the flowers had just ripped. This year, brides will appreciate the large greenleaves that are the main component of the bridal bouquet. Large leaves are collected together, the composition will give an informal look. If we add to it the fashionable flowers green hue, the bride's bouquet will look fresh, natural and unusual. 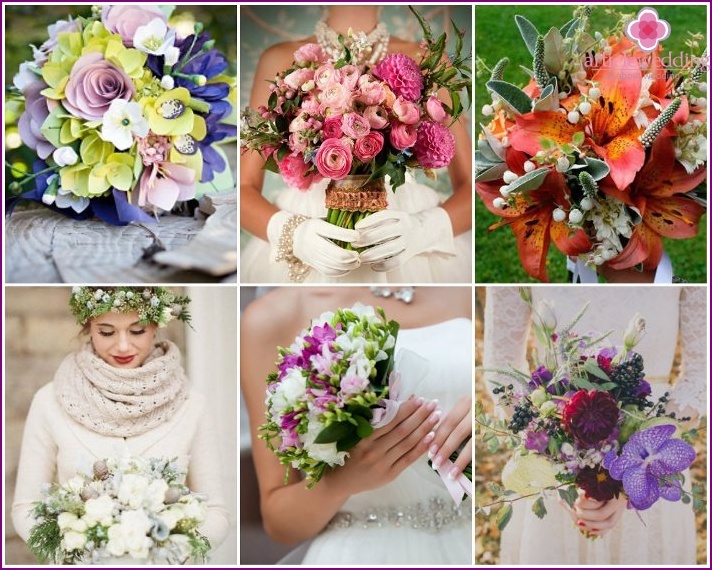 Stylists recommend when choosing a bouquet for the bride to take into account the season of the year, which is planned wedding, choosing appropriate colors shades. Wedding fashion for men this season is veryinteresting. 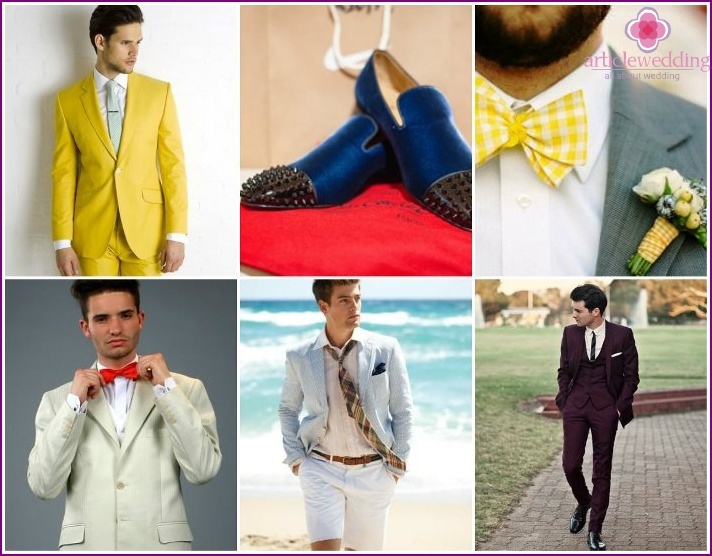 Grooms in 2015 could easily shine in white suits, which will give them a luxurious look. It is better to pay attention to the trousers and jacket are made of the same white cloth, in fact monochrome already irrelevant. The designers have taken care of the strong half of humanity, and set a fashion colorful wedding dresses: yellow, blue or purple. Strict black or dark gray pants and jacketsThey have lost their relevance. For dark shades lovers 2015 fashion offers to choose the costumes of blue tones that blend with any shade of bright shirts and make the image of the groom truly royal. Stylists recommend a bold stylistic solutions for themed weddings: a shirt with a discreet print or stripe. If until recently the only accessorythe bridegroom was a tie, and now the fashion for neckerchiefs, stylish butterfly, boutonnieres, wrist or pocket watch on a chain. If the man - traditionalist and prefers to wear to a wedding tie, then it needs to pick up so that it is in harmony not only with the groom's suit, but also with the chosen dress.